A community health assessment, or CHA, is a systematic examination of the health status indicators for a given population that is used to identify key problems and assets in a community. The ultimate goal of a CHA is to develop strategies to address the community's health needs and identified issues. To conduct this CHA, we used the Mobilizing for Action through Planning and Partnerships (MAPP) process. 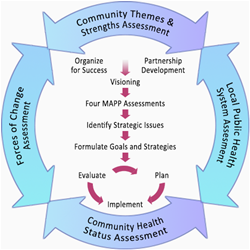 MAPP is a community-driven strategic planning framework that assists communities in developing and implementing efforts to identify and improve the health status of their community.